Still from Seven in Bed by Ellen Wetmore 2011. Software written by Eric McCann, custom audio composition by Jeff Warmouth featuring Carmen X. Materials include Xbox Kinect, PC, king size bed, data projector, speakers. 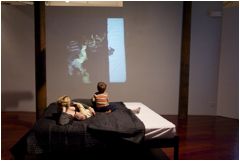 Seven in Bed is an art installation featuring an interactive video projection, a bed, and an audio composition in which visitors can insert themselves into the artwork's video memory and projection stream by getting into bed, thereby becoming part of the work. With Seven in Bed we invite people to get into bed. Whoever is there becomes part of the video. The longer a person stays in place, the longer their image burns into the video loop’s image stream, and so the longer their afterimage will remain present after they get up and leave. Eventually, all the video images of “sleepers” on the bed will be, in relation to each other, total strangers: people whose images have been acquired at different times and mixed together according to the order they interact with the work. Participants on the bed in foreground, corresponding video image on the wall in background. The authors imagined this work of nestled, sleeping strangers, but so far, in reality, in a gallery, people never sit still. The project explores the transitory nature of the human presence. No recording of the image stream is kept, so the visitor's image remains alive only within a time frame relative to their visit. This time frame can be adjusted for a long or short reaction and remembering loop. The remembered video sequences loop back on themselves creating a visual delay.